Three miles down the road from Grace Church, a Grace Brethren congregation in Akron, Ohio (Jeff Bogue, senior pastor), there is a building. That building once belonged to another congregation who lost the property in a court dispute. The facility was put up for sale, and Grace Church prayed and fasted–and placed a bid. But so did another church; who just happened to outbid them. Resigning to it being God’s will, Grace Church swallowed and moved on; until several months later, when the realtor called. The other church’s finances had fallen through. If Grace Church’s offer was still good, the building was still available. Again, God proved to be in control. Grace Church’s motivation for purchasing the building was that they were looking for a strategy to reach people within their locality. No stranger to branching out, the church has created locations that they refer to as ‘campuses’. Their main campus in Bath recognizes its brothers and sisters in Barberton, Medina, and Norton. But with this building, Grace’s elders and congregation were entering a more local mission field. Their motto has been applied in sending people out to other areas of Ohio. But never so close to home, though Pastor Wimberly and his fellow leaders certainly see the need; especially for sports and connection with youth. That is where the ‘Extension’ comes in since its purchase in October of 2014. After some hefty renovation, that is. Hallways were opened, offices converted into classrooms and the building’s gym–doubling as a sanctuary– needed to be fitted with a video and sound system. Plenty of physical labor awaited Wimberly and the others, as well as mental anxiety. Would the Extension draw in people of the community? Were there enough volunteers to help, and, more importantly, would they stay committed? Wimberly was primarily concerned that the video sermons, shown live from the main campus on Ghent Road, would be a turnoff for newcomers. Grace’s worry was for nothing. Currently, the Extension holds a weekly attendance drawing 600-700 people. Families in the area appreciate its vibe of a smaller, more personal church atmosphere. The video sermons have not posed a problem either. 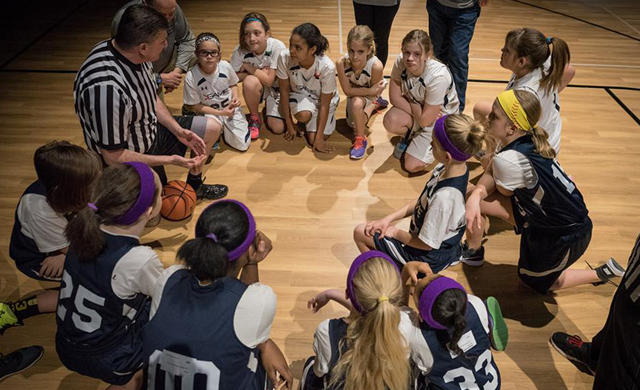 Through its services and its sports programs, the Extension is proving to be a great way for Grace Church attaching its presence to the Akron/Canton community. While a secondary location for Grace Church’s Sunday services, it is also a facility for Grace’s sports ministry. Basketball leagues are offered from kindergarten through sixth grade during a ten-week stint in January, February, and March. Other involvements include Game Day, where it’s bring-your-team-to-church, various sports teams known as Connect Groups, and any number of pick-up games that happen to take place in the Extension’s gymnasium. The main vein of ministry is, of course, discipleship, for all volunteers [coaches and otherwise] and kids participating and parents attending are discipled through Sports Ministry. Send Pastor Wimberly and Grace Church a letter of encouragement here.